Why Does The GOP Want To Push Its Own Version of Obamacare? My latest Townhall column is called, Why Does The GOP Want To Push Its Own Version of Obamacare? Here’s an excerpt from the column. Before discussing the health care abomination the Republican Party is about to foist on America, it’s worth revisiting the havoc that Obamacare wrought on the Democrat Party. 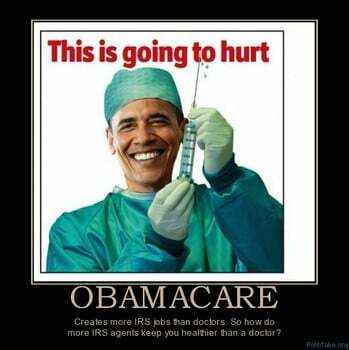 Although Barack Obama, Hillary Clinton and the rest of the Democratic Party are guilty of a multitude of sins against America, the worst one was Obamacare. The bill was never popular. In fact, it was so hated that it catapulted Scott Brown into Ted Kennedy’s seat in Massachusetts for a term. The bill was an albatross around the party’s neck and the results were devastating. During the Obama years, the Democrat Party lost 12 governorships, 900 state legislature seats, 69 House seats and 13 Senate seats. Why was Obamacare so costly to the Democrats? Because the bill wasn’t bipartisan. Because they sold it with lies. Because it was never popular to begin with. But most of all, they created a system that had a small number of winners and a large number of losers. If you had a pre-existing condition and no insurance or were so broke that Obamacare covered most of your costs, you probably like Obamacare. However, that adds up to a relatively small group of people. On the other hand, most people saw their deductible shoot way up and their premium costs went into the stratosphere. Because the Republicans are starting with the absolutely ludicrous premise that even though Obamacare has never been popular, there are popular parts of the bill and those should be preserved, they’ve had to be dishonest with conservatives and the American people. They’re keeping so many principles from the Affordable Care Act in place that they’re really just amending it, not repealing it. Since that’s the case, they’re going to have exactly the same problem that the Democrats did. There will be a small group of winners and a large group of losers, except this time the Republicans will be 100% responsible for it and the Democrats will turn out to be the ones who are 100% right when they say it won’t work. Of course, the GOP is trying to ram the bill through as quickly as possible just as Republicans did with the immigration bill because they know that the more people who find out about it, the more unpopular it’s going to be. Keep in mind that the bill has already been condemned by the Club for Growth, Heritage Action, Freedomworks and Americans for Prosperity among other widely respected conservative groups. Even BREITBART is hammering this bill viciously. That’s not surprising, because let’s be honest: if Obama had put this atrocity of a bill in front of Republicans instead of Obamacare, it literally wouldn’t have gotten a single GOP vote. What’s wrong with the plan? Well, for one thing, it accepts Obama’s premise that insurance companies should have to cover those who choose not to have insurance and then get a serious illness. So, when those people are included, by necessity costs have to skyrocket for everyone else because the rest of us have to cover the costs of their health care. So, you’re still going to have the high costs and high deductibles that are the primary strike against Obamacare. Of course, people also hated the Obamacare mandate, which John Roberts twisted the Constitution into a pretzel to support. Remember what people said? How can government force you to buy a product as a condition of American citizenship? Guess what? The new GOP plan has the same feature. In fact, it may even be worse because you’re being forced to make payments directly to the damn insurance companies. If you want to know if the insurance companies really helped write the bill to benefit themselves, there’s your answer. How would it work? In other words, if you don’t get insurance for a decade and pay 30% more for a year after you break your leg, you still come out way ahead. What that means is that we get the worst of both worlds with the GOP’s Obamacare bill. Prices will remain extremely high and the deficit will go up, but the most annoying parts of the bill will remain in place while fewer people will be covered. As an extra added bonus, the Republican Party will be committing the same kind of political suicide that the Democrats did with Obamacare. That’s because the Democrats are going to do exactly what the GOP did during the Obama years. They’re going to blame the GOP for every problem with health care, they’re going to correctly point out that the bill is a “stinking pile of garbage,” and they’re going to let Republicans hang themselves with their own rope. If the Republican Party wants to live up to the promise it’s been making for the last few years, it should use the reconciliation process to repeal a big chunk of Obamacare. Then Trump can use all the discretion he’s given under the law to let the rest of it die on the vine. Afterwards, the GOP should tell the insurance agencies to go pound sand and then Republicans should implement a market-based program that will actually cut costs and improve care. Of course, the Democrats still may not cooperate, but since Obamacare would essentially already be dead, they’d have more incentive than they would if this Hindenburg disaster of a health care program passes.